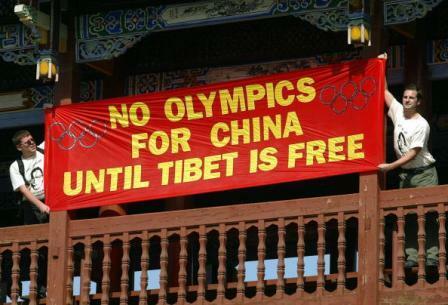 Nicolas Sarkozy has confirmed his attendance at the opening ceremony of the Beijing Olympics, after months of demanding progressive dialogue between Beijing and Tibet. RUSUTSU, Japan (AP) — French President Nicolas Sarkozy will attend the Beijing Olympics' opening ceremony next month [August], his office said Wednesday [9 July 2008], ending a boycott threat and seeking to soothe Chinese irritation over French support of Tibet. Sarkozy was the first world leader to raise the possibility of boycotting the festivities to protest China's violent crackdown on Tibet after riots and protests there in March . A snub would have been a slap in the face to China's communist leadership. After keeping the threat alive for months, Sarkozy on Wednesday [9 July 2008] reassured Chinese President Hu Jintao that he would attend the Aug. 8  ceremony, his office said. The two men spoke on the sidelines of the Group of Eight summit of industrialized powers in Japan. The Dalai Lama is expected to visit France in August . Sarkozy has said in the past that it is "possible" he might meet with the Tibetan leader, though China disapproves of such contacts. But Sarkozy's office refused to discuss the sensitive issue Wednesday [9 July 2008], saying it had to be "discreet." An Elysee Palace official traveling with Sarkozy said Chinese and French officials had mutually agreed not to communicate on that question. Reporters without Borders was among the organizers of massive protests when the Olympic flame passed through Paris in April . Many Chinese were shocked that a pro-Tibet protester in Paris tried to grab the Olympic torch from a Chinese athlete in a wheelchair. Anger reverberated in China, with protests organized at outlets of the French retailer Carrefour.